State Library Victoria – What’s Brewing? If you had an ancestor who worked at the Carlton and United Breweries or if you are simply interested in the history of the Australian brewing industry, the CUB staff magazine What’s Brewing is a recommended read. 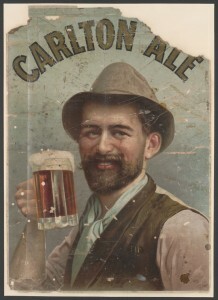 What’s Brewing ran between March 1950 and June 1967 and was developed to be the voice of Carlton and United Breweries. By the 1950’s CUB operated four breweries in Melbourne – Victoria, Yorkshire, Carlton and Abbotsford and employed well over 2000 staff. In the first issue of What’s Brewing, the General Manager Reginald Fogarty wrote that the aim of the magazine was to bring these staff together by keeping everyone informed of what went on in each section; by highlighting activities within the plant and by covering industry news. It was also a place to showcase sporting activities, social activities and personal events. The magazine contains some terrific photographs of staff employed in particular sections. 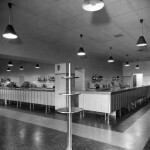 `Ladies of the Staff’ features the telephonists and typists of the Head office, the `Pay staff’ showed men filling pay envelopes with money and the `Manufacturing Area’ shows staff printing and assembling beer cartons. Each section of the brewery was also responsible for reporting staff news from their section – recent engagements and marriages, sporting triumphs, obituaries, births, retirements etc. The social pages are one of the highlights of the magazine and feature hundreds of photographs capturing dinner dances, balls, club socials, country and seaside picnics – the annual Mornington picnic often attracted over 1000 staff and their families. There were also`smoke socials’ – male-only formal dinners, with guest speakers and plenty of cigarettes and cigars! Sport was always a big part of life at CUB and the magazine gave detailed coverage to the activities of the various football, cricket, bowling and tug of war teams including club statistics, championship dinners and presentations. The magazine features regular articles on the history of brewing and brewing techniques, written by Dr. Carl Resch, head brewer and production manager from 1945-1972. 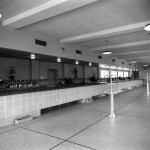 A section called `Our Hotels’ presents photographs of the CUB owned hotels and bars in Victoria. There are also many fascinating articles on the history of individual hotels and on the history of innkeeping throughout the world written by Robert K Cole, a Carlton brewer and historian. R. K. Cole will be known to many for his Index of Victorian hotels 1841-1949. 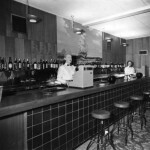 For some other great photographs of the CUB breweries and a time line covering the history of the company from 1850 onwards, please go to the Carlton and United Breweries official history website. I am trying to find out the history of Victoria Bitter beer,do you know who I could contact to obtain the different beer can variations since 1958 and how to date the release of the different cans.. I know Victoria Bitter was the first Australian beer to be put into cans in 1958,but what day & month,another words what is the birthday of the vb cans. Thanks for your comment on our post. I’ll gather some information for you and email you directly. Hi Sharon, Thanks for your inquiry. Unfortunately What’s Brewing was only produced between the years of 1950 to 1967 and from what i can see John Noonan was active around the 1890s. There are many articles on John Noonan and the Tug-of-war team in the Trove Digitised Newspaper database. Try searching the keywords John Noonan tug war. Here’s one article from The Argus newspaper that’s particularly good. You could also search for tug war noonan and refine your results to the 1890s. Also, try searching our catalogue using the keywords tug of war. You will find many images of the Australian Tug of war team. Our Family History research guide called Researching your Victorian ancestors, may also help you with your research.